Are you going to be a senior graduating in 2012? Well this is for you!!! Goldygates Photography strives to bring you fashion forward beautiful photos that are custom to you! Goldygates Photography is in need of senior reps from every school in the Northwest GA , Chattanooga and surrounding areas. 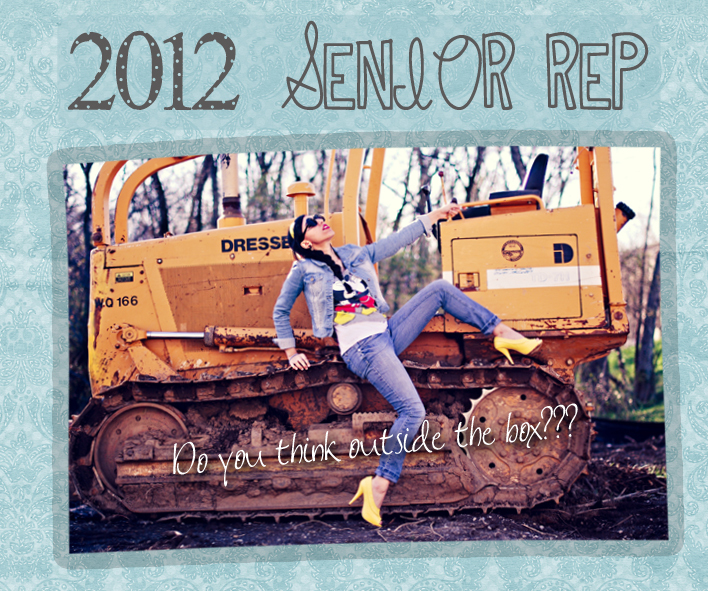 I will be accepting about 2-3 students to be senior reps from each school. *If you bring me over 15 paying clients you will receive your whole package for free. IF WE HAVE AT LEAST 5 SENIOR REPS WE WILL BE HOLDING A CONTEST. THE SENIOR REP WHO REFERS THE MOST CLIENTS BY JANUARY 1, 2012 WILL WIN THEIR CHOICE OF AN IPOD SHUFFLE OR $50 CASH. TO BE IN THE RUNNING FOR THIS YOU MUST HAVE REFERED AT LEAST 5 PAYING SENIOR CLIENTS. I need driven individuals that promise to put in work, hand these cards out and bring in their classmates... 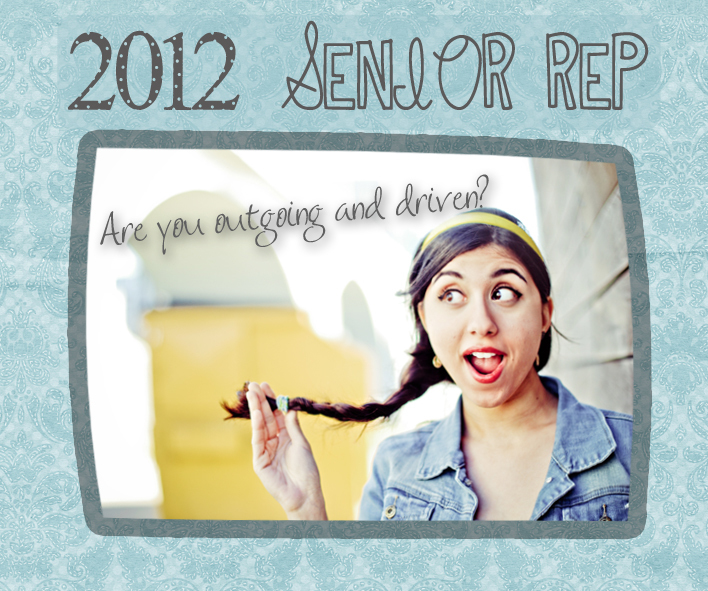 If you feel that you are not capable of handling this task please do not apply for a Senior Rep. Although We might be able to come up with another option for you. Do you use facebook, twitter, myspace, or have a personal blog? If yes, then which one(s) do you use and how often do you use them and please put the links to your profiles? 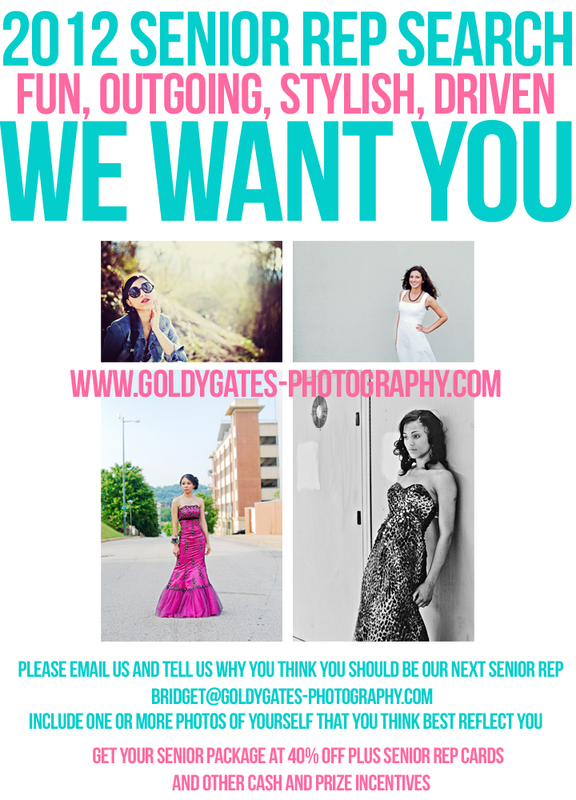 Why do you want to be a senior rep for Goldygates Photography? How would you promote Goldygates Photography?